The Cambridge Platonists are modern thinkers and the context of seventeenth-century Cambridge science is an inalienable and decisive part of their thought. 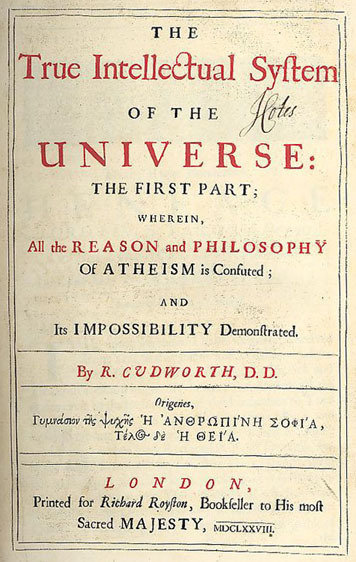 Cudworth’s interest in ancient theology, however, seems to conflict with the progressive aspect of his philosophy. The problem of the nature, however, of this ‘Platonism’ is unavoidable. Even in his complex and recondite ancient theology Cudworth is motivated by philosophical considerations, and his legacy among philosophers in the eighteenth and nineteenth centuries should not be overlooked. In particular we will draw on the scholarship of the German Egyptologist Jan Assmann in order to reassess the significance of Cudworth’s theory of religion for later philosophical developments.